Today is a good day to update this post about the Baptistery of Florence. When I initially wrote this post, one of the first of this blog, the Baptistery was under restoration, and I didn’t have original pictures to add to my post. After one year of work, Florence Baptistery is shining like a pearl in the city center. In my lifetime, it’s the first time that this monument underwent such an intervention, made to clean the marble decorations from the effects of pollution. In a way, seeing the Baptistery now in all its beauty is something new even for the Florentine people. The restoration of the Baptistery, whose effects can be seen in the picture to the left (click to enlarge) showing the monument before, during and after the work, was financed in part by the Opera del Duomo, in part with crowdfunding. It gave back dignity to a monument that for too long has been overshadowed by the huge Duomo, with people almost forgetting about his importance: for a long time, the Baptistery of San Giovanni has been the symbol of Florence. It was there long before the Duomo, before Palazzo Vecchio, Ponte Vecchio and any other attractions you can see today, witnessing the rise of a city that became the largest (and the richest) in Europe. Florence Baptistery is also known as the Baptistery of St John the Baptist or Baptistery of San Giovanni (patron saint of Florence). We don’t know exactly when it was built: the first document mentioning the building dates back to 897 a. D., when “the envoy of the Holy Roman Emperor is administering justice in front of the Basilica of Saint John the Baptist”. Art historians believe it has been started between the 5th and 9th century, and after the inspections made to allow the restoration work, now tend to believe that it is more probably in the 5th century that this building has been started. Chronicles written in the Middle Ages state that it’s the very first building of the Roman Florentia, a Temple dedicated to Mars, later recycled as a Catholic facility, but archeological excavations in the 1970s revealed that the Roman foundations below the Baptistery belong to a Roman villa, not a Temple. The current layout of the Baptistery dates back to the 12th century (the date written on top of the dome is 1174). A Baptistery is a Catholic consecrated building, but not exactly a church, used only for the Christian ceremony of Baptism. During the early centuries of Christianity, entrance to the churches was reserved to the Christians, so you had to be baptized in order to gain access. The ceremony happened only once a year in the Easter period and involved being totally immersed into water (death) and emerging from water as a Christian (resurrection). Most ancient Baptisteries are octagonal, probably symbolizing the eighth day: seven days being the human life, something that ends, while the eighth day, life in Jesus Christ, is eternal. The greatest addition to the Baptistery of San Giovanni during the Renaissance were the bronze doors, three portals located in the southern, northern and eastern side of the Baptistery. Andrea Pisano created the southern doors around 1330-36, Lorenzo Ghiberti worked about 50 years to create the northern and eastern doors. The eastern doors of the Baptistery, also called by Michelangelo “the Gates of Paradise” are one of the masterpieces of the Renaissance. Severely damaged by the flood in 1966, the original panels, now restored, are visible in the Duomo Museum, while a perfect copy replaced the doors in the eastern side of the building. 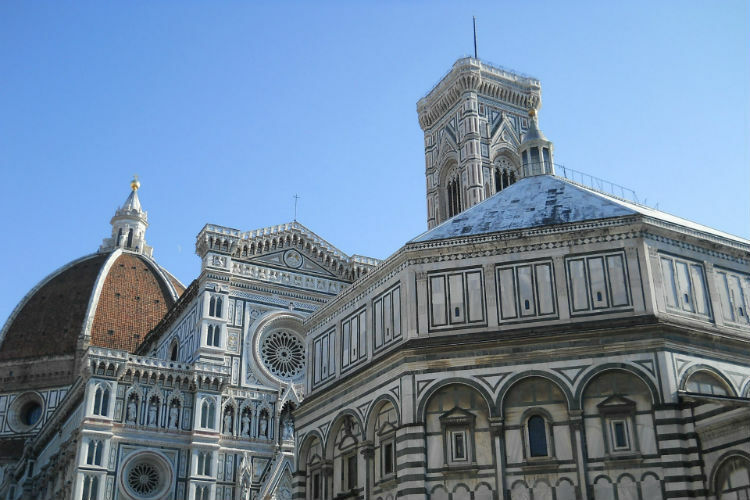 Was Florence Baptistery an ancient pagan temple? When was it built? Discover the mysteries of the most ancient of the Florence Italy attractions.